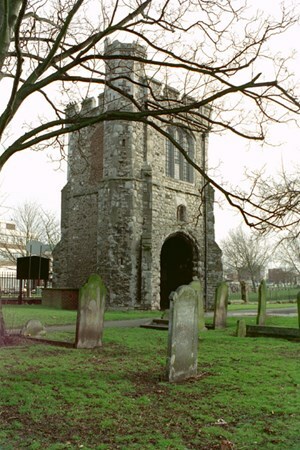 The Monastery at Barking was founded in 666 AD and dedicated to the Mother of God. From the late tenth century the abbey followed the Rule of Saint Benedict. The abbey had a large endowment and sizeable income but suffered severely after 1377, when the River Thames flooded around 720 acres (290 ha) of the abbey's land, which was unable to be reclaimed. Despite this, at the time of the dissolution it was still the third wealthiest nunnery in England. In 870 Barking was sacked by the Danes. Possibly the Holy Monastery was then deserted. In 970 it was re-founded as the Monastery of the Mother of God and Saint Ethelburga. The abbey existed for almost 900 years, until its closure in 1539, as part of King Henry VIII's Dissolution of the Monasteries. It had many notable abbesses including several saints, former queens and the daughters of kings. The abbess of Barking held precedence over all other abbesses in England. The ruined remains of Barking Abbey now form part of a public open space known as Abbey Green. It is recognizable for its partially restored Grade-II Listed Curfew Tower, which features on the coat of arms of the London Borough of Barking and Dagenham. Here are the main saints associated with the monastery, some of whom feature in the icon above. Various spellings of the names of the Saints are in use. Heaven rejoiceth exceedingly, and the lands of the English exult with jubilation, for the saints of Barking stand at the throne of God, interceding unceasingly for those who honour them.